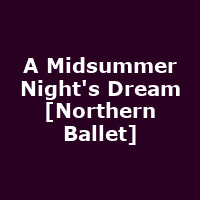 "Northern Ballet's A Midsummer Night's Dream sees the romantic antics of a touring dance company played out on one magical night as the company travels by sleeper train from London to Edinburgh. It's the final rehearsal and emotions run high as artistic temperaments clash with romantic entanglements. The time comes to leave for Edinburgh but the tensions continue on board the train and as the Company settle down for the night, the train enters a tunnel and the dream begins."